Tea and Symphony was a British musical group of the late 1960s and early 1970s whose style may be described as “progressive folk”. From Birmingham, they recorded two albums for Harvest Records, had one track, “Maybe My Mind (With Egg)”, included on the Harvest sampler Picnic – A Breath of Fresh Air, toured Britain with Bakerloo (Blues Line) and were guests on John Peel’s BBC radio programme. The group was generally a trio, though sometimes supplemented by extra musicians. 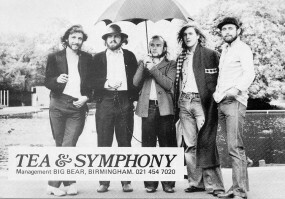 Members included Jeff Daw (vocal, guitar, flute), James Langston (guitar, vocal), Nigel Phillips (keyboards, vocal, percussion, left 1969), Dave Carroll (guitar, bass, violin, vocals, joined 1970, left 1971), Bob Wilson (guitar, keyboards, joined 1969, left 1971) Peter ‘Chatters’ Chatfield (drums, joined 1970, left 1972), Tom Bennison (bass guitar, French horn, joined & left 1970), Mick Barker (drums, joined 1971), and Stewart Johnson (guitars, vocal, joined 1971). Steve Eaves is another former alumnus. 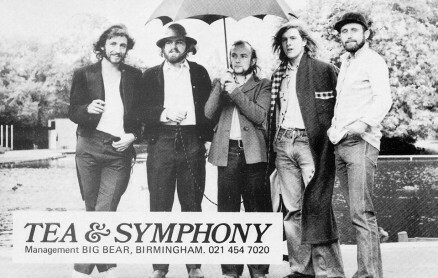 Does anyone recall seeing Tea and Symphony at the Digbeth Civic Hall New Year’s Eve 1969? Supported by a young band called Dark Tower. Would love to hear about it. It’s reasonable to mention that they toured with a liquid light show as part of the band. I can’t remember the first guy’s name who was excellent, but after it was me (aka Ephemera Lights) in 1970.